Nothing excites us more than starting a new build, and this year’s biggest build was no different. We pulled out all the stops to make this off-roading Toyota 4Runner TRD Pro a monster all its own. Not only was this an opportunity to make our client happy, but it was also a chance for us to showcase all of our skills at Handcrafted. To start, we would like to feature some of the exterior customizations made to the vehicle. First and foremost, a second battery was added to the vehicle in order to power all the systems and modifications. Using a custom-built kit by ShrockWorks, a second yellow-top optima battery was added to the vehicle. The aux battery kit also included a mounting bracket that allowed for the relocation of the factory air pump and washer fluid reservoir, as well as a bracket to hold the blue sea systems ML-ACR, which helps to protect the new electrical components. A custom fuse box was also added in the engine compartment to house the various switches and relays needed to control the lighting and controls added to the car. Rigid Industries Lighting on Roof Rack, including a 40-inch adapt bar with GPS module. The adapt bar allows for changes in the beam patterns based on the vehicle speed. This build provided us an opportunity to create an off-road beast that still offered plenty of creature comforts that would also make for a safer off-roading experience. From your iconic jerry cans that offer additional gas canisters, to the soundproofing for a quiet and comfortable ride, this 2017 build pulled out all the stops. Our favorite component for this build was the specially designed enclosure for the subwoofer, which was created to fit specifically in the space between the fridge and storage box. This vinyl wrapped enclosure comes with a special-made and etched box that has the TRD Pro Logo and is lit up with red LED lights. 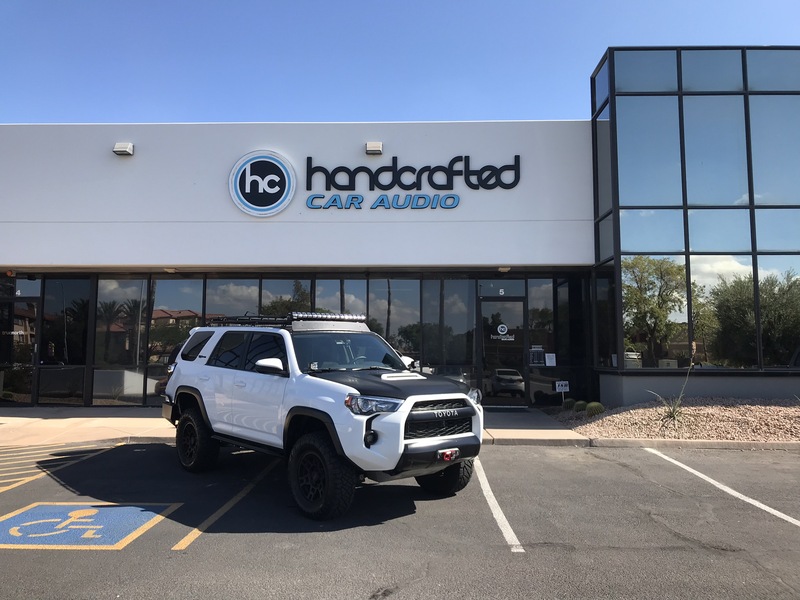 While the 2017 4Runner provided plenty of challenges, it also offered a great opportunity for us to showcase our abilities in manufacturing and wiring. We are proud and looking forward to the next one!